Wilkes-Barre, part of the Wyoming Valley, is framed by the Pocono Mountains to the east, and the Endless Mountains to the west. The majestic Susquehanna River flows through the center. In the 1800s, hundreds of thousands of immigrants flocked to the region to work the mines. Wilkes-Barre was located in the heart of the anthracite fields, and thus smack in the middle of development. The accompanying growth they triggered, coupled with inevitable economic and cultural changes, transformed the rural farming region into a thriving urban center. 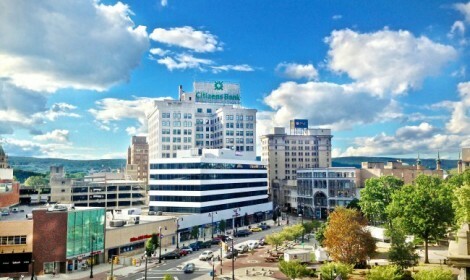 Wilkes-Barre soon became the region’s financial center and home to rich and powerful entrepreneurs. Their business ventures affected the railroad-and-canal system that stretched 165 miles southward to Bristol. The first documented burning of anthracite occurred in Wilkes-Barre. In 1808 Judge Jesse Fell discovered that forced air made the hard-to-burn coal an efficient heat source. This discovery helped change Luzerne County from a quiet frontier to a thriving region where mining was king. Today, one of the best places to glimpse Wilkes-Barre’s past is the Luzerne County Historical Society Museum on Franklin Street. It has Native American exhibits, anthracite coal displays and presentations that highlight important natural and cultural events of the Wyoming Valley. Nearby are Wilkes-Barre Commons, the F.M. Kirby Center – a center for the performing arts, and the Luzerne County Courthouse – one of Pennsylvania’s most impressive architectural masterpieces.